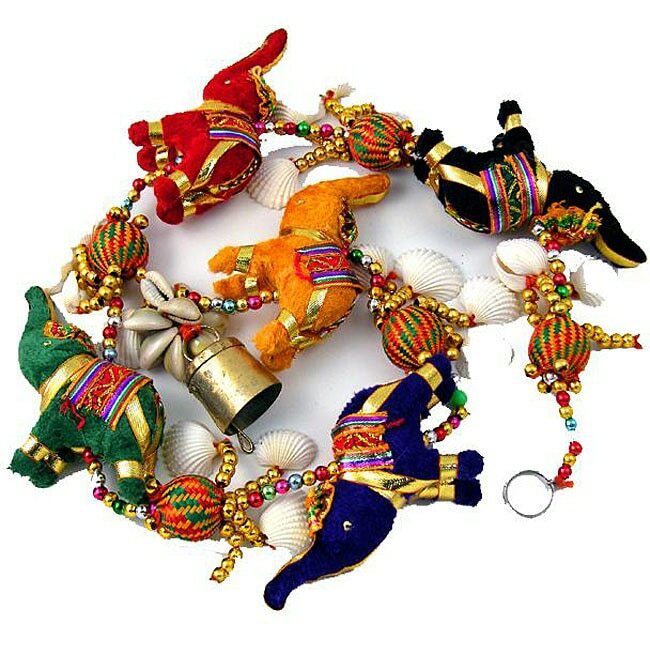 Made by the puppet maker community in Jaipur, these 5 little elephants with trunks pointed up for good fortune are hand ornamented with saddles and head gear and the piece includes decorative shells and beads and a brass bell at the bottom, the nicest one I've seen in years. Measures 34 inches long, light in weight (6 ounces) and easily hangs up anywhere as exotic and charming Indian decor. Elephants in India are considered VERY good luck. This product is beautiful. It is much larger than I thought. Just perfect. Thank you so much! A previous reviewer is correct, there is a strong petroleum-like smell when thee box is opened. I would suggest hanging them outside for a few days, if possible. However, the elephants are very colorful and well-made and the overall effect is quite charming. Very Beautiful and colorful. However it has a very weird smell. I have only had it a couple of days, so I am hoping the smell will go away with time. I've gotten hooked on buying things from the World Collection on Overstock. My sister loves elephants so I got this for her birthday. It's very pretty if you're looking for something thoughtful and different. It's very fragile and you can tell it's handmade, but she loved it just the same. For the price, I would recommend it. I am extremely happy with these beautiful elephants. I purchased one for a friend & one for me. They are pretty & seem well made. Very colorful. Product is as pictured; I just hope they are as lucky as they are beautiful! The item arrived quickly and looks just like the photo. It's colors were vibrant and it was actually longer than I thought, which was a nice surprise. My only issue was that it arrived with one of the shells broken off. It it very delicate and you don't really want to play around with it at all. It is going to be a christmas gift, so I just wrapped it right away, too scared that I would break it even more. Very well made.....Colorfull and great detail....A true piece of art.....I think it belongs inside.....Not sure it would do well outside....Very happy with this purshase.